Sugar Cookies – Recipe and Report Card! A local restaurant, Coyote Blue, makes crispy sugar cookies in coyote shapes to serve with their signature dessert coffee. I always shamelessly request extra coyotes and was inspired to make my own–but in cat shapes, of course! I don’t mind sharing–I have a major development opportunity in the area of rolling dough and cutting out shapes. True to form, I picked a difficult shape to work with, as tails add complication. So here is my self-report card with grades you may recall from your 70s childhood: E for Excellent, VG for Very Good, S for Satisfactory, NI for Needs Improvement. 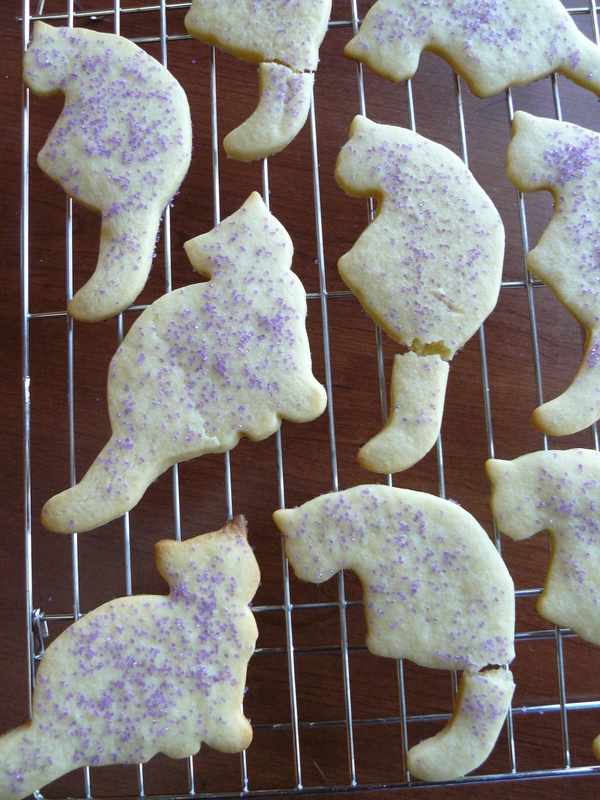 The silhouette shapes were challenging to move from baking sheet to cookie rack in one piece; therefore, three of my sugar katties are of the Manx variety. Tip: use a spatula big enough to support each cookie! Just as good as Janey’s and Coyote Blue’s. Must learn to roll dough evenly. 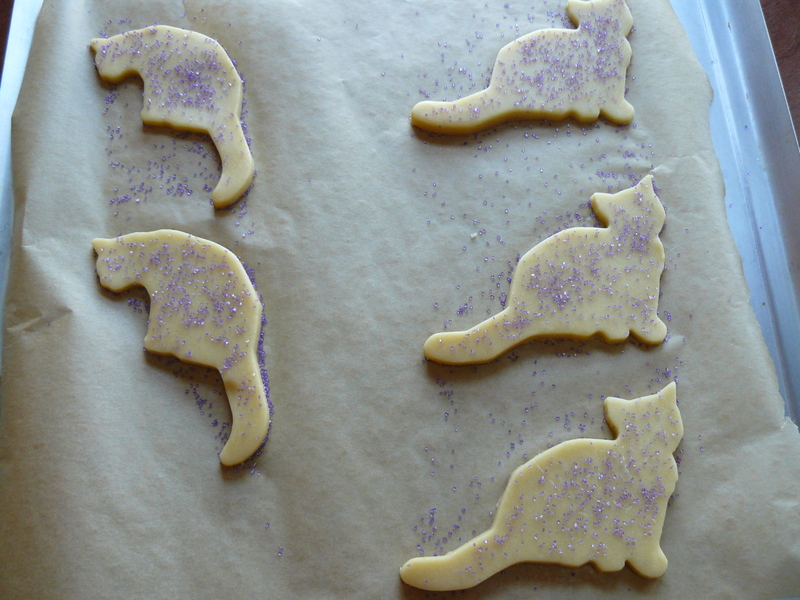 I involuntarily baked a couple of “seal points” because the ears were thinner and baked to a deeper brown color. To replicate this cool effect, attempt to place the ears of the cutter closer to the thinner edge of your dough. Or maybe your dough is all even?! Seal point and Manx sugar katties coolin' on the rack! Joy of Baking recommends chilling the dough “about one hour or until firm enough to roll.” My mom historically skipped this step. She has a magical kitchen and things tend to work out for her regardless. Roll dough on a lightly floured surface. Cut out shapes and sprinkle with colored sugar. Bake on parchment paper at 400 degrees F for 6-10 minutes, depending how thick you rolled the dough and the shapes you chose. My goal was slightly less than ¼ inch thick. Watch them carefully. You’ll want to pull them from the oven when the edges just begin to brown–or, in this case, when the cats’ ears develop seal points! Won’t you be my neighbor? I shouldn’t eat all these cookies by myself, but I just might! 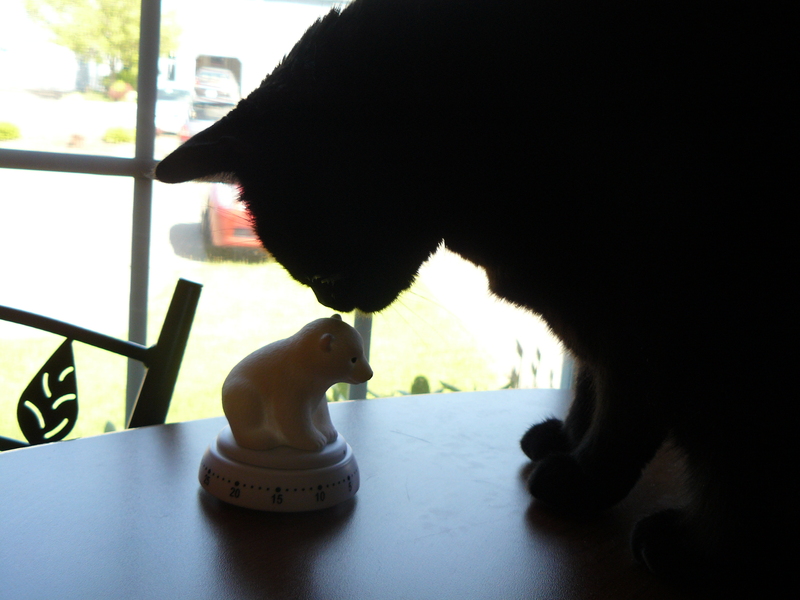 "Welcome to my kitchen, little bear!" P.S. 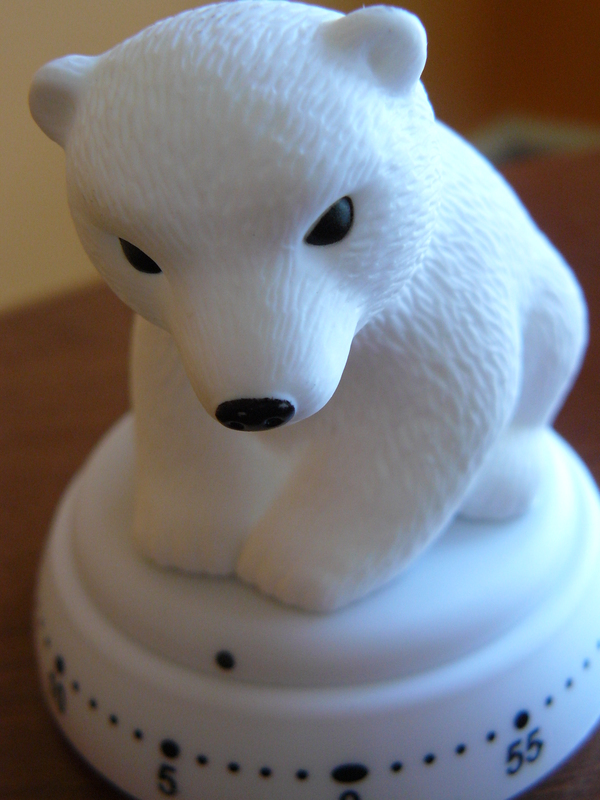 Is this not the world’s cutest kitchen timer? you’s write good and have your way wit dem words! not to mentchin you’s can cook and take purdy picicatures also..
Sugar-cookie kitties are, sadly, as tough to tame as other cookie characters with fine details. We’re not big sugar-cookie fans. Your recipe’s got enough butter for us, however. We’ll try ’em in simple shapes and then serve them with something exotic. I like the blue sugar you used. Did you make this with coloring in the food processor or buy? A second on Chef’s Emporium! A huge place with unimaginable stuff for cooking. Re: timers. We have several standard 60-minute timers in the kitchen and the chefs swear by them. Me, I march to the beat of a different drummer; I fly by the seat of my pants, sans-timer. Steaks are easy; when I put the first side down I go out and smoke a half a cigarette; I turn it and then go out and smoke the rest and pouf! I’ve got a perfect, medium-rare steak. Baking’s a more exact science, but I etch in my mind when a batch is supposed to come out of the oven and even if I’m half-way across the house (or restaurant, in my case), I see the clock and am reminded that I need to check the oven. My life is highly regulated by bells and timers. Part perfectionist and part in recognition I always get into something else and need the reminder bell to bring me back! HA HA! I love these! Too cute. I wonder if you could do some kind of chocolate or cinnamon-swirl cookie to make tabbies or torties? So adorable. Too cute to eat. I have hardly seen cookies that cute! I love Sugar cookies with tea, and that is a great recipe!